Hiring an air compressor can be a smart and cost-effective decision. An air compressor is a big investment and a decision to buy one should be an informed choice. If you are not certain of your compressed air requirements then hiring one is a good way to test the water before making the decision to buy. Hiring an air compressor is also useful to those who need a temporary replacement or if additional machinery is required to suit an immediate need. Hiring an air compressor can be an effective way to utilise compressed air for a single task or job or to cope with an unexpected influx in demand. Ultimately the decision to rent or buy an air compressor comes down to finance and demand. Renting a compressed air system will mean that you know exactly what you need to pay with no unexpected maintenance costs. Depending on the intended use, you could save money in comparison to buying an air compressor that may be sparsely used. Hiring an air compressor can be very cost efficient as you only borrow the compressor on an ‘as-needed’ basis. Glaston Compressor Services Ltd based in the North West hires out a range of different air compressors offering a delivery and fitting service. You can hire an air compressor from Glaston on a weekly, monthly or rent-to-own basis. Glaston offers flexible, cost-effective rentals with scheduling designed to make it more convenient for its customers. Glaston also offers leasing packages for air compressors and other machinery. Glaston stocks a range of air compressors from HPC KAESER available to hire. Glaston is an authorised distributor of HPC KAESER Compressors in the UK and supplies static electrical and portable diesel driven compressor equipment suitable for any application. Compressors available for lease or hire are available in both oil free and oil flooded options. The use of portable air compressors has risen significantly in recent times mainly due to the increase in construction which requires the use of portable air compressors onsite. Portable air compressors function in the same way as a standard air compressor. The main advantage of a portable air compressor is obvious, it is portable and therefore can be moved between job to job or from location to location within the factory or on site. A portable compressor has wheels to roll the compressor around the site and is therefore much more lightweight than its full-sized counterpart. 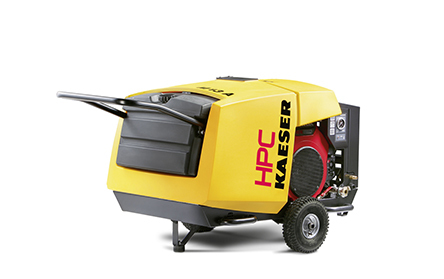 HPC KAESER has developed a series of portable air compressors which are far less noisy than a full-sized compressor. It is a myth that portable air compressors are less powerful than standalone compressors with many portable air compressors designed for rugged use and dependable performance. The HPC KAESER Mobilair portable compressor is designed to give you air wherever you need it with a fuel-saving motor and heavy-duty chassis that features a rotational moulded PE enclosure that is tension-free for extreme dent resistance. Glaston supplies a range of different portable air compressors to choose from and would be happy to discuss which portable compressor would be most suited to your specific needs. To find out more about all of Glaston’s compressor services contact us here or call on 01695 51010.